Electricity is usually available and can be easily routed to actuators over long distances. The power is easily controlled, and auxiliary control signals can be provided with the same "runs" as the power signal. Electrical faults are often easier to diagnose than air or hydraulic faults. Electric motors permit manual, semi-automatic and automatic operation of the valve. Motors are used mostly for open/close functions, but they are used for positioning the valve to any point opening for control. The actuator may be designed for multi-turn or quarter-turn valve types. In the case of globe or gate valves, the actuator has to turn many times to open or close the valve. In case of butterfly, plug or ball valve, the actuator has to move only 90° to fully open or full close the valve. A motorized valve consists of following main components. Motor: Single phase or three phase motors are used in electrical actuators. DC motors may also be used. The motor moves in forward or reverse direction as per the requirement to open or close the valve. The motor torque is a function of the horsepower of the motor and the gearbox. Gears: To reduce the high speed of motor and increase power, a gear arrangement is provided inside the gearbox. The reduction ratio of a typical electric actuator is high, and the gearbox is always self-locking to prevent accidental closing, opening or drift. Clutch and Manual Lever: When electricity is shutoff or interrupted, the actuator (valve) can be still be operated manually through the use of a hand wheel. A manual clutch arrangement is provided which disengages the gearbox and engages the hand wheel. 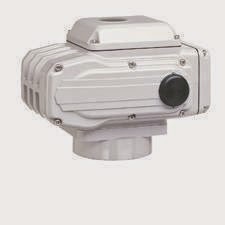 Motor Control Switch: The motor control switch is located inside the actuator for protection from the surrounding atmosphere. Included are the switching devices (contactors or solid state switches), control circuitry, and motor protection (fuses). The motor control system is used for forward or reverse direction to open/close the valve, and for proportionally opening/closing the valve. Limit Switch and Torque Switch: To stop the actuator at the end position (i.e. full open or full closed) limit switches are provided. When the valve reaches the end position, one of the limit switches operates and the motor is stopped. Torque switches are provided to prevent the actuator from over-loading due to high amp draw from driving too much torque. Always consult an application expert before installing or specifying an electric valve actuator.